The recipe comes from my go to cookbook Plenty which I have written about before. The recipe in the book is amazing, but I need to modify it for more every day baking. The original recipe is special for two reasons. 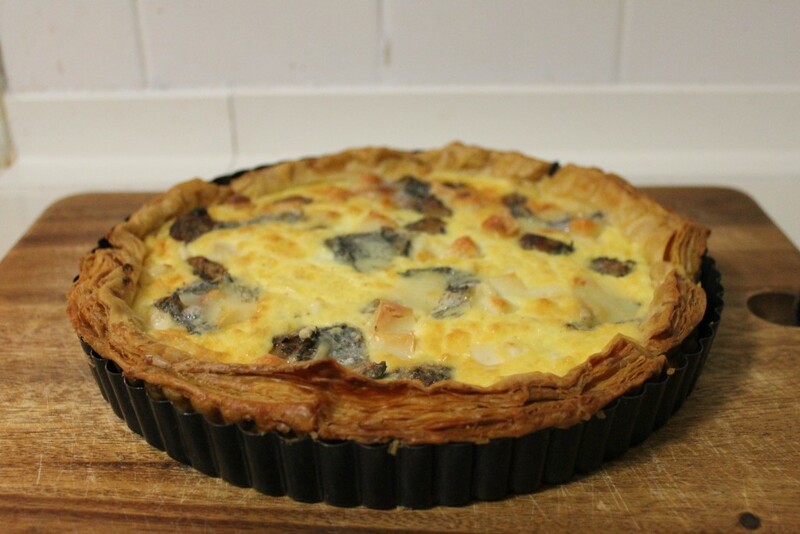 The first reason is because it is rich – buttery pastry, creme fraiche, double cream and about 200g of quality cheese. The second reason is because beautiful cheese is expensive, so it isn’t something you can make every day. Yottam uses both hard and soft goat cheese in his recipe which we bought at our local fromagerie, but I think you can substitute more available cheese such as parmesan or brie if you like. I have changed the quantities slightly to make it less rich, but I won’t scrimp on the puff pastry and Carême is the best brand to buy. The caramelised garlic is amazing too. The garlic flavour is mellowed by cooking process and you end up with a sticky and soft spreadable garlic that would also be delicious on toast. Line a shallow 28cm loose bottomed tart tin with the pastry. Trim the edges. Line the tin with baking paper and fill with weights. Place in the fridge for 20 minutes. Put the garlic cloves in a small pot of water and bring the water to a simmer. Blanch for 3 minutes and then drain. Dry the pot and place over a high heat and add the olive oil. When the oil has warmed, add the garlic cloves and fry over a high heat for 2 minutes. The garlic will start to colour slightly, this is ok! Add the balsamic vinegar and water and bring to the boil, then simmer gently for 10 minutes. Add the sugar, thyme and 1/4 tsp salt. Continue simmering on a medium heat for about 10 minutes, or until most of the water has evaporated and you are left with a sticky syrup. Meanwhile, place the pastry case in the oven and blind bake for 20 minutes. Remove the baking weights from the pie and bake for a further 10 minutes or so until the case is lightly browned. When you are ready to assemble the tart, dot the garlic cloves and cheese over the base of the tart. Beat together the eggs and cream, and gently pour around the tart so the garlic and cheese are still slightly visible. Place in the oven and bake for about 35 minutes, until the eggs are set and the top is lightly browned.